The college where my wife works focused on the Holocaust during April, featuring the play “The Diary of Anne Frank,” a Holocaust Cantata, a lecture series that included a Holocaust survivor, and a photo display by a local man who served in the European Theatre from 1942 to 1944. U.S. Army Lt. Col. Max Kammer chronicled his experiences in the war through photography, capturing most of the photos in this exhibit at Ordoff and Buchenwald, Germany, cities where some of the initial World War II attacks occurred. Max is a personal friend, was a childhood friend of my father, and is Jewish. For many of us the Holocaust is a nebulous thing, something we’ve heard about, but perhaps don’t know much about. That’s what it was for me, at least. I knew, for example, that Hitler’s Germany mistreated, imprisoned and murdered millions of Jews, and I had seen photos here and there from the camps, but I hadn’t gotten a close view until I saw Max’s photos and watched the play about Anne Frank. It’s a compelling story about an extremely bright and talented young lady. The story is so good that even an untalented cast can’t mess it up. The cast I saw did a very good job. Max’s photos were taken as his company liberated the concentration and death camps. 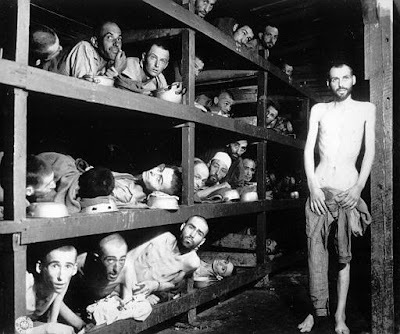 Mostly, the photos did not show bodies of Jews murdered by the Nazis; they showed prisoners in their cells, thin as rails, living in unbelievable conditions, like the one shown at left. There are people who argue against the commonly accepted story of the Holocaust who are identified as “Holocaust deniers.” Contradicting the term, these folks don’t claim the Holocaust didn’t occur — most of them, anyway — they claim that the Holocaust did not occur in the manner and to the extent commonly accepted. In fact, the “deniers” really think that term is inappropriate, preferring “revisionists.” They don’t believe that the Nazi government had a policy of deliberately targeting Jews and people of Jewish ancestry for extermination as a people; that six million Jews were systematically killed by the Nazis and their allies; or that genocide was carried out at extermination camps using tools of mass murder, such as gas chambers. Commonly, Holocaust denial suggests that the Holocaust is a hoax aimed at advancing the interest of Jews at the expense of other peoples, and is generally considered to be an anti-Semitic conspiracy theory, the methodologies of which are often criticized as ignoring historical evidence to reach a predetermined conclusion. A great deal of the denial or revisionism occurs in the Arab nations, and Iranian President Mahmoud Ahmadinejad is one of the more recent examples. He said just three years ago that the Holocaust was a fairy tale that had been promoted to protect Israel. Are the Arabs, or perhaps more properly, the Muslims, the modern equivalent of Nazi Germany? The Holocaust is all too real to Max, and he has the evidence on film and paper. His photos don’t prove six million murders, but they show the brutality and horrors that Hitler subjected Jews to starting in 1939. Whether the number is six million or the revisionists’ lesser numbers is irrelevant; the brutality and inhumanity are appalling, ghastly and unimaginable. We all can think of people we don’t like very much, or maybe actively dislike, or perhaps even hate. But it takes a special person to be so screwed up that they hate an entire race or group, and that characteristic is magnified to a level that is difficult to comprehend when such people actually brutalize and kill the group that is the focus of their hatred.